So when I checked my Research Assistant badge requirements, there was written you've edited 0/50 tag wiki's. Please can someone explain me what's it all about and where am I wrong? The research assistant badge is for editing the tag WIKI. For only providing an excerpt, you won't make progress on that badge. Just do know that the excerpt and wiki need to explain when to use the tag on a post. They are not an advertisement for the topic of the tag and certainly not a plagiarized copy-paste from a wikipedia or product website. With that said I assume you agree that your revision of the excerpt on blogger isn't actually explaining for which questions the tag is appropriate. It is the blurb that you copied from Wikipedia without attribution. That is called plagiarism and is not okay. Please don't do that for the edits you plan to make on these excerpts and wikis. Not the answer you're looking for? Browse other questions tagged support badges tag-wiki help-center . Do tag wiki excerpt edits count to the Research Assistant badge? 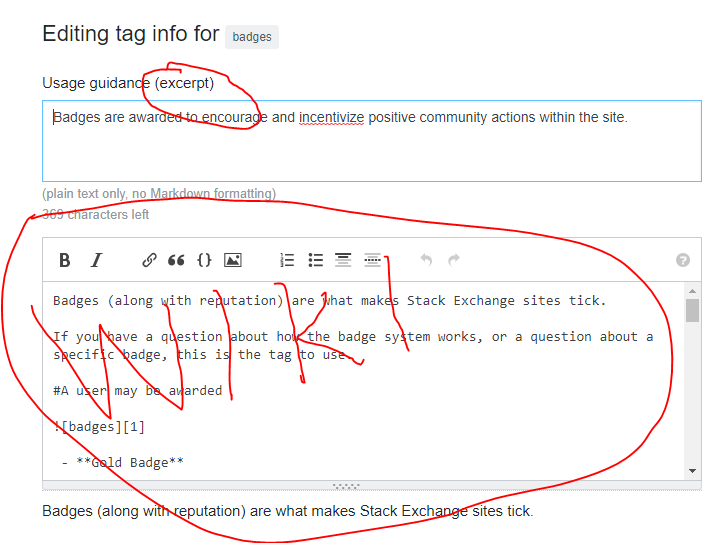 Add hyperlink “improve tag wiki” to tag hoverbox for easier tag editing? Research Assistant badge progress incorrect? Why was my tag-wiki excerpt edit rejected, even though it makes the description more accurate? Why was this descriptive tag excerpt rejected?